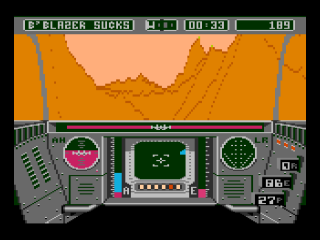 Long rumored to exist somewhere, the 7800 version of Rescue on Fractalus was finally discovered in 2004, still in the hands of the original programmers. 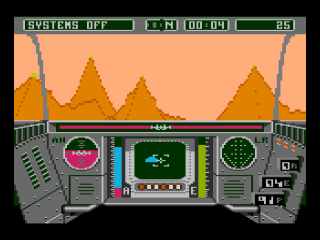 Although the 7800 version of Rescue on Fractalus was never completed, it proves how amazing the 7800 could be if properly programmed (why didn't all 7800 games look this good?). The improvements over the 5200 version are staggering, and shows how powerful Atari's little new system was. On this page I'll concentrate solely on the 7800 version of the game, for a complete review of how the finished game would have appeared look over at the 5200 Rescue on Fractalus page. 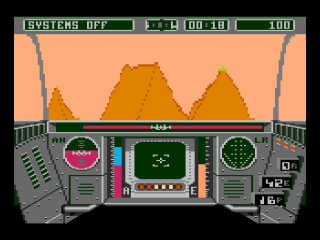 The first thing you'll notice upon starting up this prototype is that the there is no title screen or mother ship launch. 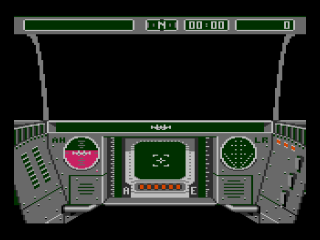 Instead, this prototype starts with a static view of the cockpit and a black screen. 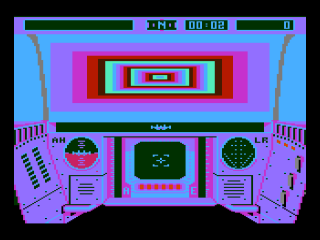 To start the game, press the reset button and you'll be treated to a cool psychedelic launch sequence. Once you've recovered from the trippy colors, you will see the plant surface come into view. 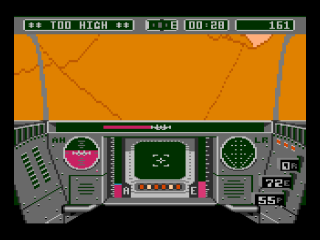 Once you've flown around the planet and crashed into a few gun encampments or stranded pilots, you've pretty much done all you can in this version. While the visuals are all there, the actually gameplay has yet to be implemented. There is no way to to shoot, land, or rescue stranded pilots. It appears that this version was nothing more than a movement demo.